that got me so inspired, I ran right out to Lowe's to pick up the parts. If Johnny would get out of the way, you would see that I bought this thing called a Rev-a-Shelf. 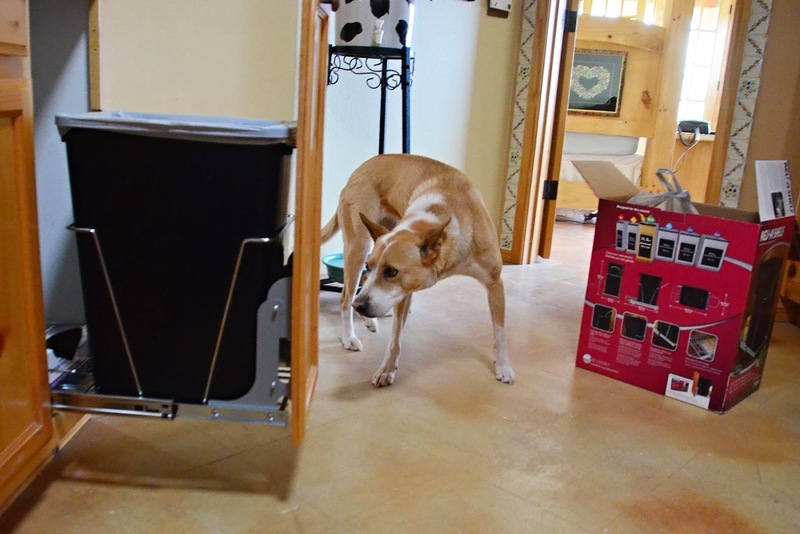 It's a contraption that you install inside a cabinet whereby your trash can slides in and out when you open the cabinet door. to have a new gadget which might ease the trauma. but I tried to maintain a positive attitude as I began to trash my kitchen. Plan A would have been the ideal location to install the new gadget because this is the cabinet I've been opening for eight years to deposit my trash. 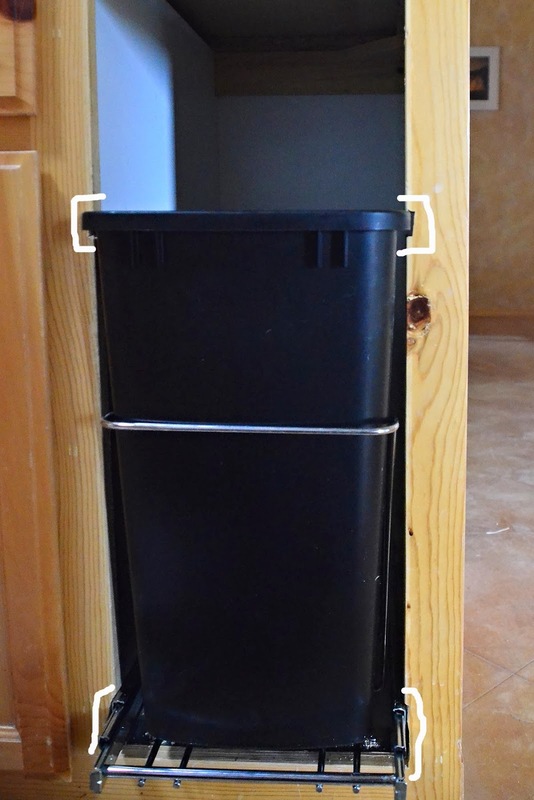 Alas, I wasn't in the mood to reroute the plumbing to accommodate the new, taller trash can. Sure, I could have used the old, shorter can with the new gadget, but what fun would that be? With the bigger can, I won't have to take out the trash as often. 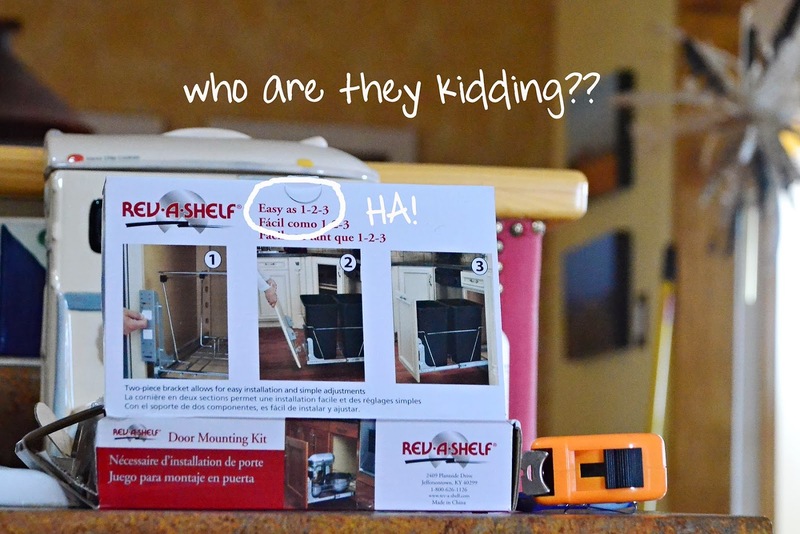 The Rev-a-Shelf kit is meant for a cabinet with an opening of 11.5". My cabinet had an opening of 10.5". Hmmm. And this is why God invented chisels. A few taps here, a few taps there, and soon the slider cleared the newly widened opening. A few more taps here and there, then the trash can also cleared the opening. I had to go for the extra-lazy option, the one where the can slides out automatically when you open the door. This involved a separate kit with a bunch of brackets which would be "easy as 1-2-3" to install. Yeah, right. But amazingly, it was pretty easy – so easy, it can even be done wearing slippers. 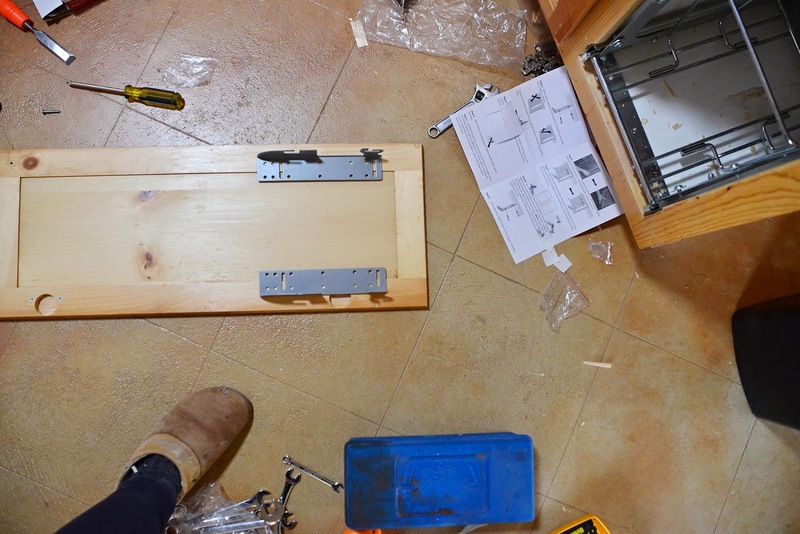 and align the brackets before any screws were screwed. And it only took a dozen or so trips back and forth to the garage to amass all the stuff I needed to complete the job. More importantly, the entire project took only one trip to town, which is some sort of record. Me: Look, Smooch! It works! but if I pretend I'm interested, maybe I'll get a cookie. See that? Easy as pie! Now, can you come to MY house? You knocked my socks off with that invention. I love garbage cans that pull out with the drawer. Anything that makes trash easier to deal with is a Wooo Hooo accomplishment in my book. Well done! Ah, the glider. 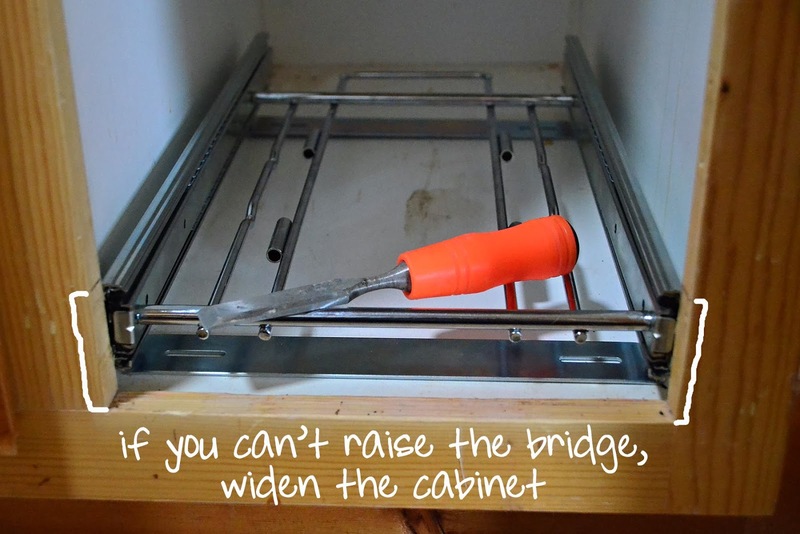 I personally believe all cabinets should glide! Holy cow! You are they DIY maven! Good luck retraining your brain on the location of the trash. I reorganized my bathroom drawers and cabinets several months ago and still don't know where anything is. Good job. My sister has one of those, but not the close by itself feature. You rock DIY big time. Wow!! I am very impressed eh! My DH & I installed a set of sliders for canned goods - they are the best upgrade cabinets can get. He really wants the garbage slider but we are cabinet/plumbing challenged in the kitchen. Thanks for the tip on a great house blog to follow. Clever! You have outdone yourself at DIY. Me. I just keep the whole trash can outside on the floor of the kitchen in all its dirty glory. 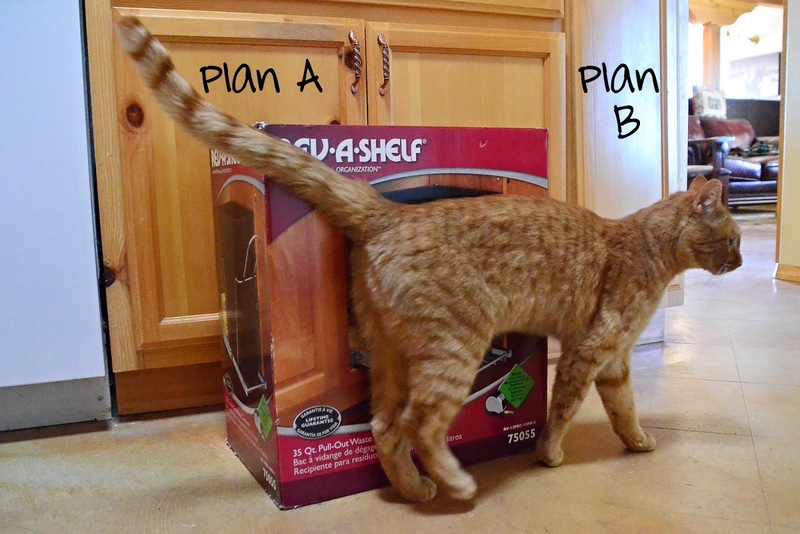 You are such a clear thinker when it comes to DIY. Wish my hubby was. We had, you note it is past tense, just such a trashcan. He didn't notice that it touched the plumbing a tiny bit. It unfastened the nut on the u trap, we had a mess. Now we have a trashcan next to the stove...boo hoo. And yes we all still go for the missing trash can under the sink and it has been 3 months. Yay for you and congrats. Thanks for your comment on Mr. Jameson. If he turns out to be 1/10th the dog that dear Smooch is we will be happy. 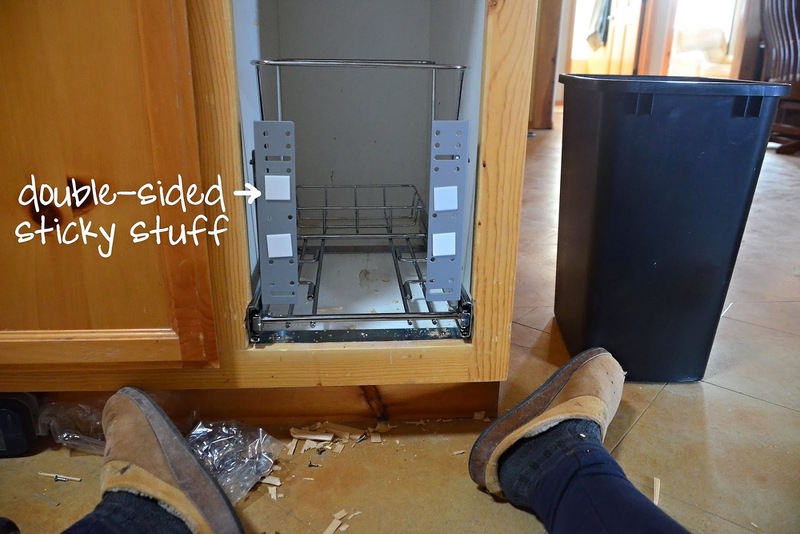 I have glides in most of my base cabinets and a pantry cabinet. They make it possible to put canned food or boxes all in a row and you can see what's what without taking out the ones in the front. I put all the lids to my pots and pans into a basket and stuck it on one of them so I can pull it out and find the right lid. 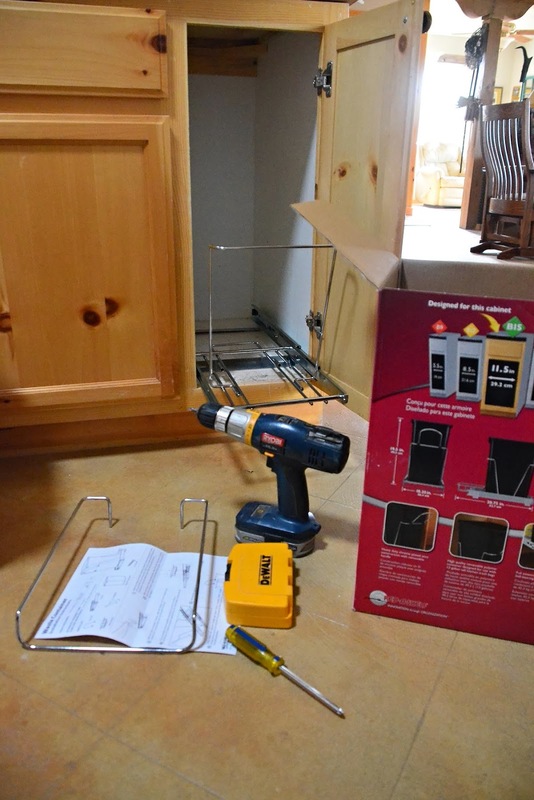 Of course, after I did that, I saw on line many different ways to store lids, including attaching them to cabinet doors so they're right there when you open the door. What did we do before the Internet? You are one resourceful lady. Congrats! If you can do it, I can do it. This summer I will be converting a "hole" from a 3 year old "inop" trash compactor that costs waaayyy to much to repair. I look forward to calling you and getting a coaching session through the experience. 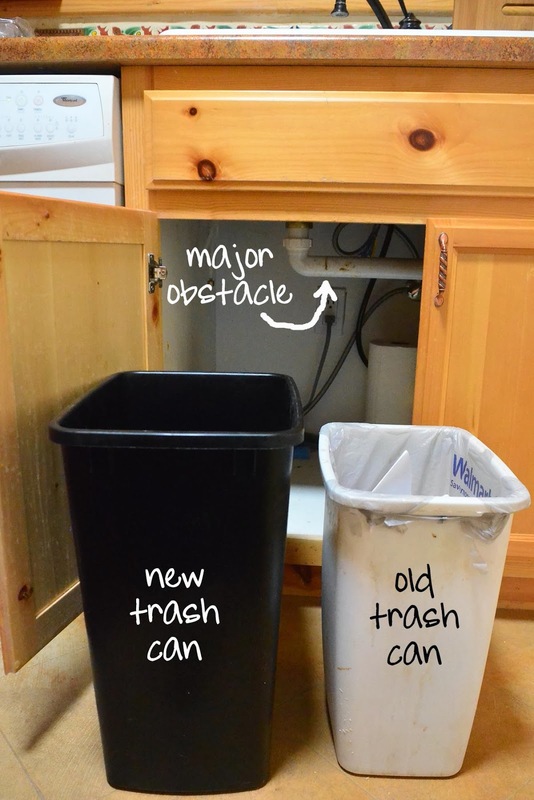 Don't you love the idea of not having to get on your knees to retrieve wayward trash from around the old can. Now, go forth and make some trash. I could never do that. Congrats !!! Carson, I just know that your dad is smiling down at you. I'm pretty sure he is, and he's probably thinking my projects wouldn't take nearly as long if I cleaned and organized the tools in my garage. hurray for your handy competence! love the pix with your sleepers! plus opening the post with Johnny and ending with Smooch is real treat! Ha! Your ambitions for me far exceed my skills. I don't think I'll ever be ready to build a house. 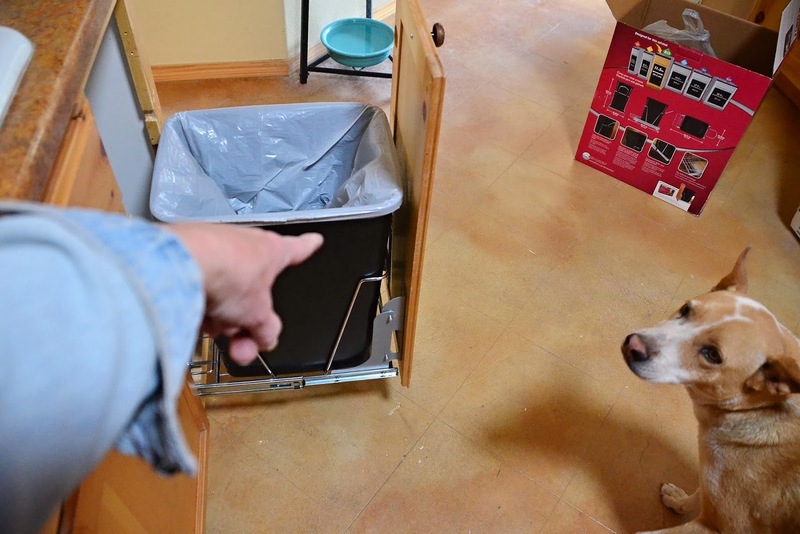 I don't blame you for being excited about a sliding trash can. Not one bit! That was one of the things we put in our new kitchen. At the time I thought it was a bit silly. Not now! I LOVE it!